Happy Friday! I'm Chelsey Dulaney, giving you the rundown on markets as we head into the weekend. This morning, we'll get the first read on U.S. second-quarter gross domestic product. Economists expect it to be one of the strongest quarters in years. Meanwhile, the earnings bonanza slows today though a few big names including Twitter, Exxon Mobil and Chevron report this morning. Plus, I dive into a surprising earnings-season development: U.S. exporters—the group investors worried were most exposed to the rise in trade tensions—are logging the strongest growth. Global stock indexes mostly climbed Friday as investors remained upbeat over the tentative trade detente between the U.S. and the European Union. U.S. exporters are growing faster than companies that do most of their business at home, a sign that trade spats and rising costs for things like labor and commodities aren’t yet derailing the corporate profit expansion. Firms with large overseas businesses have reported 12% growth in revenue so far for the second quarter, according to Credit Suisse. That’s nearly double the rate of growth for domestic-focused firms. Exporters’ profit growth for the second quarter is also beating Wall Street expectations. Earnings have jumped 23% from a year earlier, above 17% growth for domestic firms. Investors have worried in recent months that tariff fights between the U.S. and China, Europe and Canada would hurt multinational firms that rely on overseas sales. Companies are also struggling with labor shortages and higher costs for things like raw materials and transportation. Those fears had encouraged investors to dump shares of exporters in favor of domestic-focused companies. 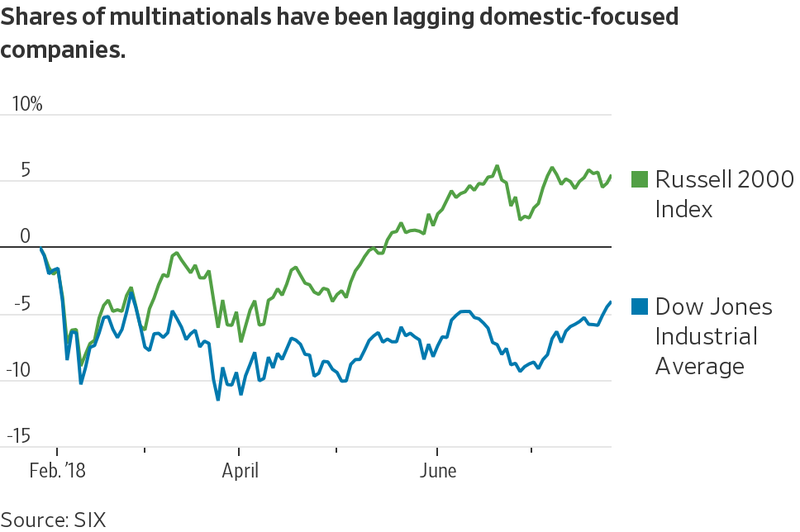 The Russell 2000 Index—composed of smaller firms with less foreign exposure—is up 10% this year, compared to a 6.1% gain for the S&P 500 and 3.3% for the Dow Jones Industrial Average. Earnings reports from companies including Honeywell International Inc. and Boeing Co. indicate that strong economic growth is offsetting those pressures for now. During its earnings call this month, Honeywell described the impact of tariffs as “minimal” while raising its 2018 sales guidance. Aviation giant Boeing, whose shares have been hard-hit by tariff concerns this year, on Wednesday boosted its revenue outlook amid strong global demand. “We’re not necessarily hearing companies voice an overwhelming amount of concern about trade,” said Patrick Palfrey, an equity strategist at Credit Suisse. “For all the concerns, demand is still there, consumers are still opening up their wallets." Will exporters' growth streak continue? Let the author know your thoughts at chelsey.dulaney@wsj.com. Facebook Inc. shed $119 billion in market value on Thursday, likely the largest-ever daily loss of value for a company. The drop dealt a blow to hedge funds: around 22% of funds tracked by Goldman Sachs owned the stock. The S&P 500 is just 1.2% off the record closing high it set in late January. The Dow has further to go: the blue-chip index is 4.1% below its January record. On this day in 1694, the Bank of England opened for business in London to print currency and manage the national debt.